Everyone tells me I can get Lyme disease from a tick. Is this the only thing I can get from them? While tick bites are most commonly associated with Lyme disease, there are several lesser-known ailments that can be transmitted by these stealthy arachnids (nope, they’re not insects—they have eight legs). According to the Centers for Disease Control and Prevention, tick-borne illnesses other than Lyme disease include babesiosis, Rocky Mountain spotted fever, ehrlichiosis, southern tick-associated rash illness and tick-borne relapsing fever. The CDC estimates that there are about 20,000 new cases of Lyme disease a year, although rates of the other diseases are much smaller and much harder to estimate. A 1998 study that collected ticks in one county in New Jersey found that over 50 percent of them carried Lyme but only 14 percent had babesia—the parasite that causes babesiosis. 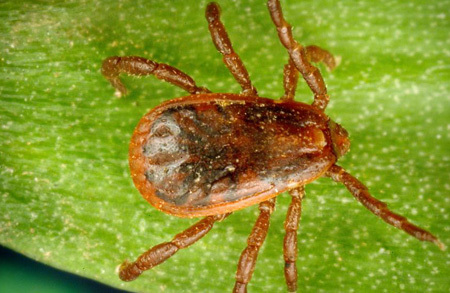 Tick diseases are mostly caused by the bacteria and parasites living in the ticks. During their feasts, which can last up to three days, the disease-causing pathogens enter a person’s bloodstream. Most of the illnesses produce general flu-like symptoms, including fevers, malaise and aches, and often go unreported due to this similarity. It is the extreme cases, like my father’s recent bout of babesiosis, that bring rare tick-related diseases to a doctor’s attention. In his case, it is unclear when the original tick bite occurred. But on Father’s Day when I called him to wish him well, he was anything but. He had been lethargic for the past two weeks and was now experiencing some unexplained urinary problems. His doctor referred him to an urologist. On Monday, the urologist diagnosed a prostate infection and sent him home with a prescription for antibiotics. By Thursday, he wasn’t any better and decided to go to the hospital. But the doctors there were flummoxed. It was like a real-life episode of House with infectious disease guys, spine guys, blood guys, gastrointestinal guys all coming and going, working to figure out this mysterious illness. Uncovering the enigma was difficult because babesoisis is so rare. Eventually it was the hematologist that discovered the culprit: the parasite babesia gobbling up his red blood cells (much like malaria does). After a five-day hospital stay and a course of intravenous antibiotics, my dad is now home and on the mend. Although it can often be difficult to distinguish between a tick-borne illness and another more widespread ailment, like the flu, there is one key marker that can set a bite apart. In up to 80 percent of Lyme cases, a bull’s-eye ring rash can form almost a month post-bite. Southern tick-associated rash illness and Rocky Mountain spotted fever can also produce rashes that spread around the original bite site. The good news is that most of these infections can be treated pretty easily with antibiotics. The better news is that according to the CDC, if you remove the tick within 24 hours of being bitten, the odds of transmission, at least for Lyme, are almost zero. Just be glad that you’re not in Eastern Europe, Asia or Africa. Ticks there can carry Crimean-Congo Hemorrhagic Fever, which can cause high fevers, joint pain, vomiting, and in severe cases jaundice, nosebleeds and large areas of bruising, reminiscent of other scary hemorrhagic diseases like Ebola. Read The Dearborn Conference “How the Test was Spun” to see how and why we are being misdiagnosed with the 41+ year old ELISA (screening us out) testing. Please read it, for you and your loved ones.